The law enforcement and training industry is a small world. 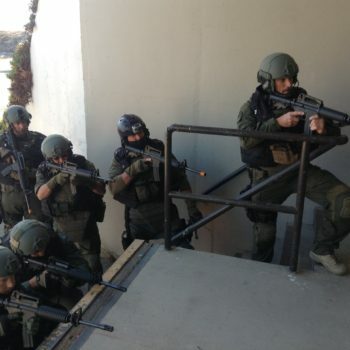 SBTactical is based in Santa Barbara, California which is an extremely small community. But even in smallest communities it can take time to connect the “obvious” dots. Our local Sheriff’s department utilizes the iCOMBAT training system and we know their training cadre and SWAT members rather well. Little did we know that The Squad Room Podcast, a podcast dedicated to police officer mental and physical wellness, stress management and leadership and is hosted by one of our local sheriff deputies, Garrett TeSlaa. In fact, prior to ever meeting us TeSlaa was (and continues to be) a huge supporter of iCOMBAT training systems and he didn’t know that we were based in the community that he patrols. Once the dots were connected, a friendship was established and ultimately SBTactical became a sponsor to The Squad Room. In the below audio clip from episode 16 , you can listen to TeSlaa recap how by happenstance, he was introduced to our very own Todd Manes and how we ultimately became sponsors of his podcast. Listen to the short clip below and head over The Squad Room podcast homepage and blog for more episodes. We are very excited about this ongoing partnership and have decided to feature TeSlaa as a guest blogger here on our SBTactical blog. 1. They must show an outward and consistent dedication for support for police officers. 2. They must make a product or service I use personally and that I believe in. 3. They must support the goals of this podcast and spread the word about health and fitness of Law Enforcement. We urge you to tune into The Squad Room and listen and read what Garrett has to say about iCOMBAT training systems in his guest post which will be featured on the SBTactical Blog with a personal account of using our iCOMBAT training system for the first time and how exceptional it truly is, so stay tuned! Read more about our training systems here and please check out our other blog articles and features with video from our training described in the podcast.